Yep, flying home last week again I was both unable to print a boarding pass online and subjected to “manual” screening due to the SSSS that was printed on the boarding pass handed to me at the ticket counter. The agent (again) confirmed that someone with a name not dissimilar to mine is on a watchlist, and that’s causing all these problems. 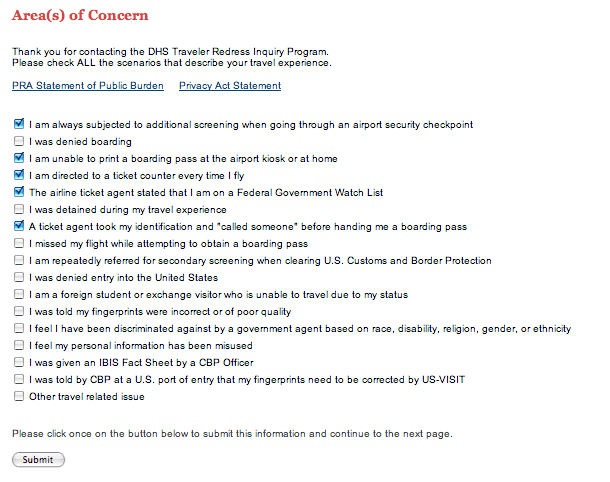 Let’s hope the new DHS TRIP program can resolve this once and for all, otherwise I might want to go visit the DHS in person to fix it. It’s bad enough having to experience this, it’s worse when your children have to watch you get “screened” (as they did this time) and it’s unacceptable when your pre-school children are forced to go through it themselves (as happened the last time). Fix it, DHS. This “guilty until proven innocent” mentality isn’t helping anyone. This entry was posted on Thursday, May 3rd, 2007 at 11:30 am	and is filed under rants, travel. You can follow any responses to this entry through the RSS 2.0 feed. You can leave a response, or trackback from your own site.